Ripe strawberries, decadent chocolate and gourmet cheese… these are just a few of the sensual foods lining the aisles of Montreal’s Jean-Talon Market. 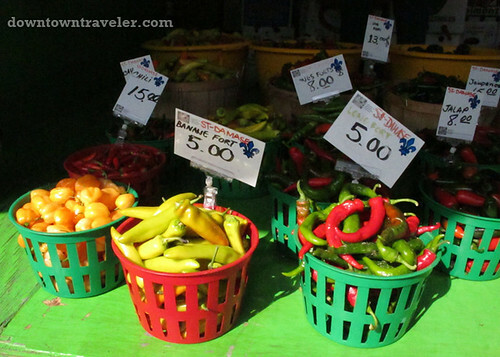 One of North America’s largest outdoor markets, Jean-Talon features 300 stalls of fresh, locally-grown produce. The most amazing thing about this Montreal institution? It’s open year-round, despite the notorious Canadian winter! 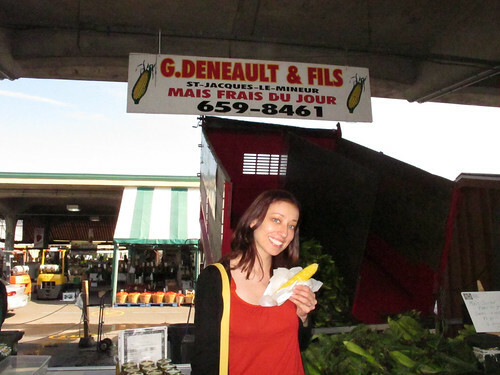 Scroll down for the highlights of the Jean-Talon Market, and don’t forget to visit on your next trip to Montreal. Warning: Walking down the aisles of Jean-Talon causes sensory overload. The scent of steamed corn wafts through the air as rainbow-hued vegetables jostle for your attention. You can’t help but wonder, have you ever seen strawberries this red? 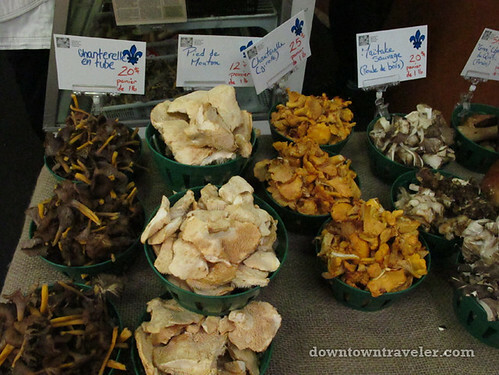 Free samples and low-cost snacks abound at Jean-Talon. 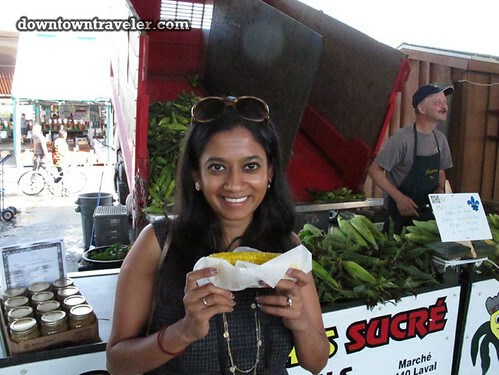 I tasted steamed sweet corn– right from the truck– with travel writer (and fellow New Yorker) Charu Suri of Butterfly Diary. You can’t visit Canada without picking up a jar of pure maple syrup; it’s the perfect souvenir of a trip up north. 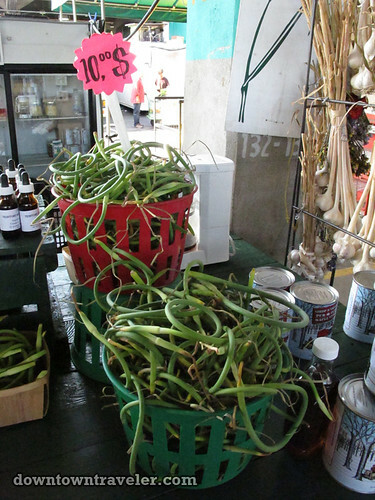 You’ll feel good about buying your gifts at Jean-Talon since the vendors are local farmers and small business owners. If you’re used to sliding jellied cranberries out of a tin can, make sure to pick up the real thing. 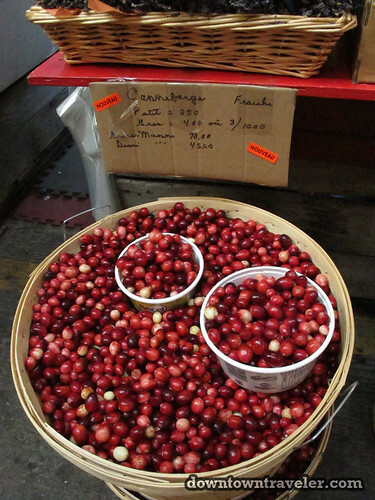 Fresh cranberries are a staple of fall dishes in Canada and the US. Strolling down the aisles of this massive food market is hard work! Reward yourself by tasting locally-produced cheeses at Le Marche des Saveurs du Quebec, a gourmet boutique located next to Jean-Talon. 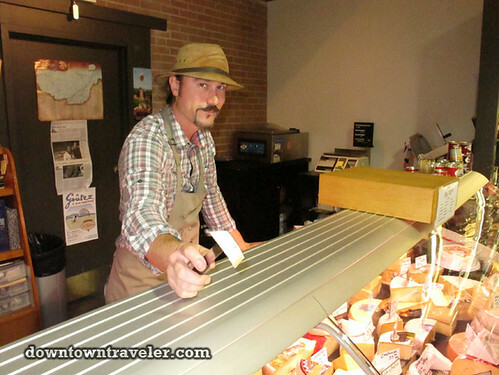 Don’t leave without sampling Alfred le Fermier, a raw cow milk cheese, and Chevre Noir, an aged goat milk cheddar cheese. Owned by a mother-daughter team, Le Marche des Saveurs only sells products made in Quebec; specialties include fromage, ice cider and craft beers. Nothing beats fresh berries– except sweetened berries sitting atop a rich cheesecake. 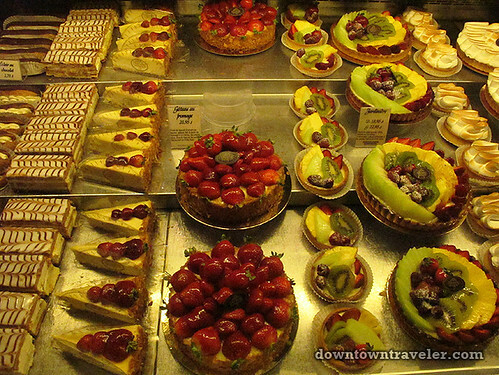 My heart skipped a beat as I entered Première Moisson, a bakery located inside the Jean-Talon Market. 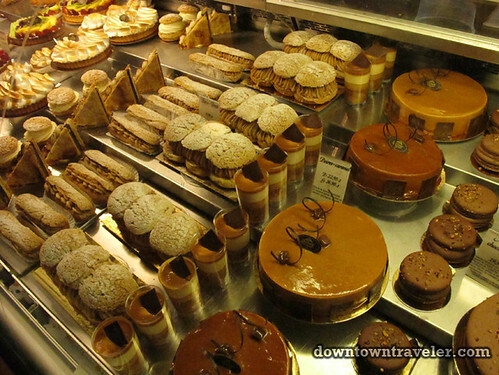 Based in Quebec, this chain boulangerie serves pies and pastries to suit every taste. 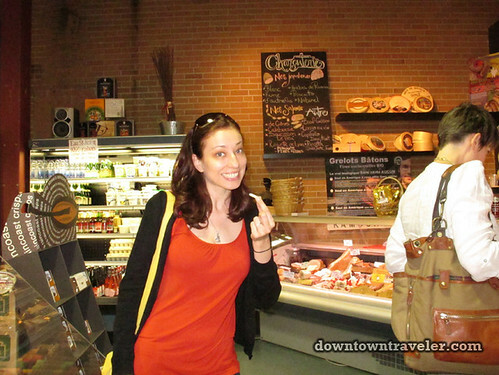 If you don’t have a sweet tooth, stock up on artisanal bread or charcuterie. 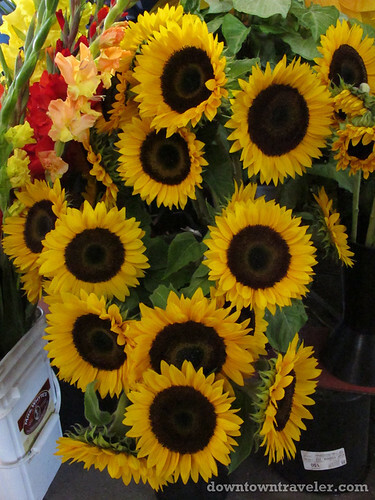 It’s hard not to smile when visiting Jean-Talon. Meeting local farmers, nibbling on complimentary samples, and buying the freshest, most colorful produce you’ve ever seen– what’s not to love about this free, open-air attraction? All of the above photos were snapped on a Cannon G11 at the Jean-Talon Market in September 2011. My trip to Montreal was sponsored by Tourisme Montreal. For information on city attractions and events, visit the Tourisme Montreal website and Twitter feed (@VisitMontreal). Click on #MontrealArts to read my other Montreal posts. 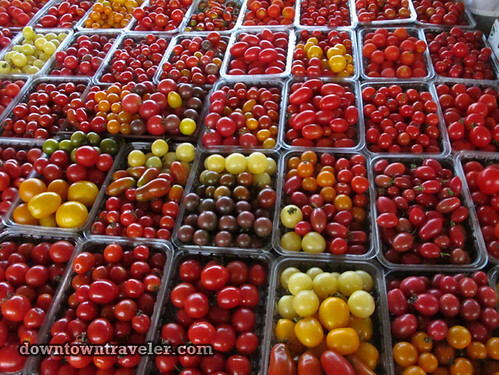 Amazing produce…so fresh and yummy looking! Love the produce pictures the colors are so vivid! Yum! Looks amazing. I’ve been to Montreal a number of times, but not made the markets. What a great town, and now another great reason to visit. I have never been to Montreal. If the great Butterfly Diary and Leslie Travel recommend it I will have to go. I could also go and practice my French. It all sounds and looks so delicious. Love the pics of you and Charu too!! 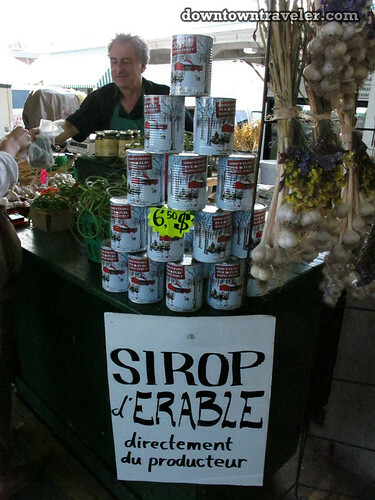 Nicely done Leslie, and love the pictures…I wish we had bought a bottle of neige (ice cider) though…darn..next time! Great! 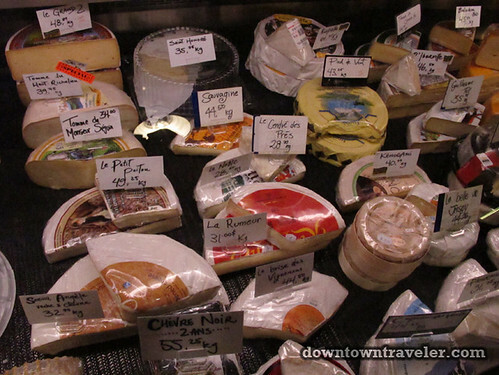 Have you tried the Brillat Savarin at Fromagerie Hamel? A triple cream Brie that is better than butter. 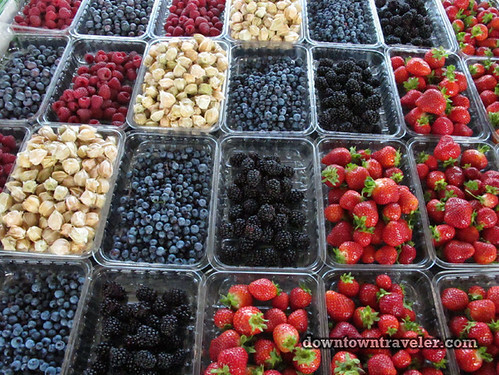 This market looks divine! The beautiful colors, comforting smells and fresh Canadian air must have been the perfect way to begin your day! I love Jean Talon Market in Montreal. Another great thing about the market that you didn’t mention was that it’s just not a market in the sense of buying groceries. There are plenty of stalls and food purveyors there that you can easily have an amazing lunch and/or dinner there at a fraction of the price of a restaurant. I LOVE Quebec’s cheese, beer, fresh veges, and french bread! Oh man… wish I could stay there longer. Thought, it was too expensive on my budget. Haven’t been to Montreal, but would love to! I suddenly feel the urge to back a lot of fruit pies! Great pics!